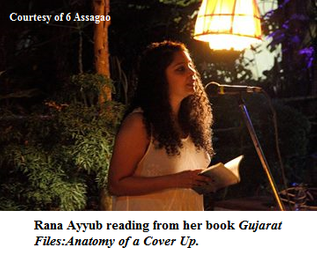 6 Assagao appeared on the scene in Goa three and a half years ago as a confluence of art, intellect and social activism. Nilankur Das, who is part of the team that makes the events at 6 Assagao a reality, reflects on a social awakening birthed by the turbulent atmosphere of Assam in the 80s. Marked by political unrest, student agitation, secessionist movements, the Indian Army’s combing operations and the President’s rule, this time period shaped his motivation to work in the development sector, and later in outreach and communication programmes. Taking root in the philosophy and ethos of People Tree, 6 Assagao is styled as a catalyst to the creation of social capital, to raise activism driven individuals who use their talents and powers to pursue social development and progress. It is to be a platform for the dispensing of information on rights based issues which will bring forth stories that are appealing and novel with artistic undertones, and bonded with contemporary concerns, lives, and aspirations. ‘6 Assagao was just waiting to happen when we discussed the possibilities four years ago. We started off with socially conscious film screenings and grew from strength to strength to be a platform for multidisciplinary art forms. It is becoming a place to explore and strengthen connections between social activism and artistic practices,’ says Nilankur. 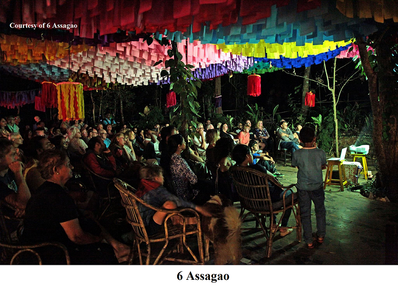 6 Assagao has gained much fame for its comprehensive array of programmes that include screenings and discussions on documentary, art house and independent cinema, artists’ presentations, lecture demonstrations on various subjects, acoustic​ original​ music, book launches, alternative and traditional theatre, poetry performances, spoken word, play readings, etc. The highlights have been filmmaker Saeed Akhtar Mirza’s explanation of how the blood lust stoked by a world torn apart on religious lines had turned his soul cold, and Seth Tobocman, a member of the radical avant-garde anti-art movement ‘NO!art’, talking about the Occupy and Squatters movement​s. People Tree founder Orijit Sen’s sharing of his views and understanding after his travels to Palestine, the stirring rendition of ‘India, I see blood in your hands’ by activist music band Imphal Talkies, and Rana Ayyub’s reading from Gujarat Files, her book revealing the truth about the 2002 Gujarat riots, which was met with a standing ovation, are some of the other significant programmes held at 6 Assagao.